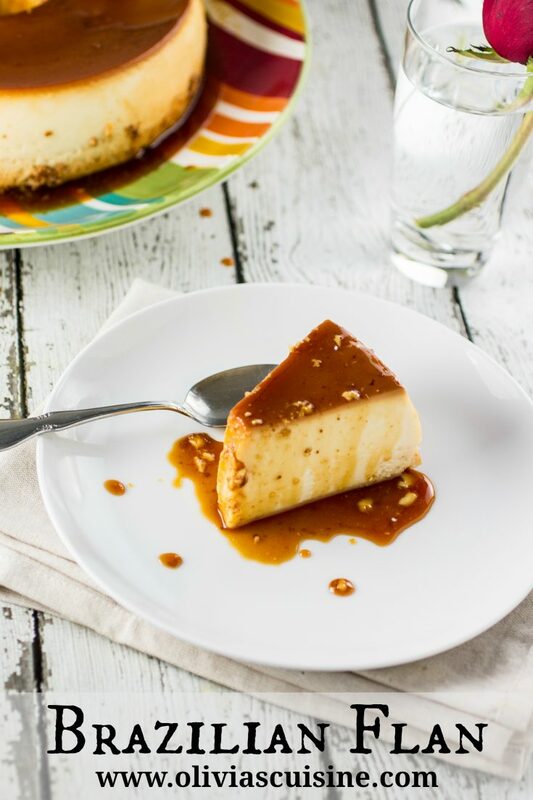 One of my favorite desserts, this Brazilian Flan is made in the blender and only requires 5 ingredients! What do you love the most in life? I love feeding people! I mean, I really really enjoy seeing everyone letting go to their animal instincts and devouring my food as if there won’t be any food left ever again. Is that bad? It’s not like I want anyone to develop an eating disorder, but which cook doesn’t love to see people enjoying their creations? And what better way to see if a recipe works than to see everything vanish in a matter of minutes? That happened with this Brazilian Flan. While I was testing recipes I realized Tim and I couldn’t possibly eat all that flan by ourselves. So I brought one to work to share with my coworkers and, oh my, it was a huge success! Even the dieters decided to indulge a bit by having a spoonful that turned out to be a whole big slice. 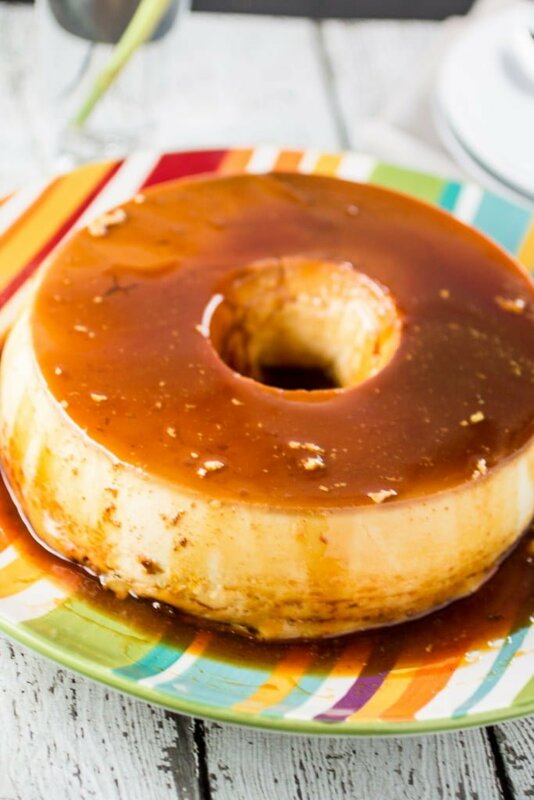 Flan is a very popular dessert in Brazil. It is in every single restaurant menu, at parties and at every family’s table. I grew up having flan at least once a week. I believe that its popularity is given not only to its deliciousness but also to how easy it is to make. I was impressed that my coworkers were so surprised flan was this good. I guess they haven’t been eating the right (ahammm, Brazilian!) kind of flan. Because in Brazil it is really rare to eat bad flan, or as we call in Portuguese, ‘pudim’. 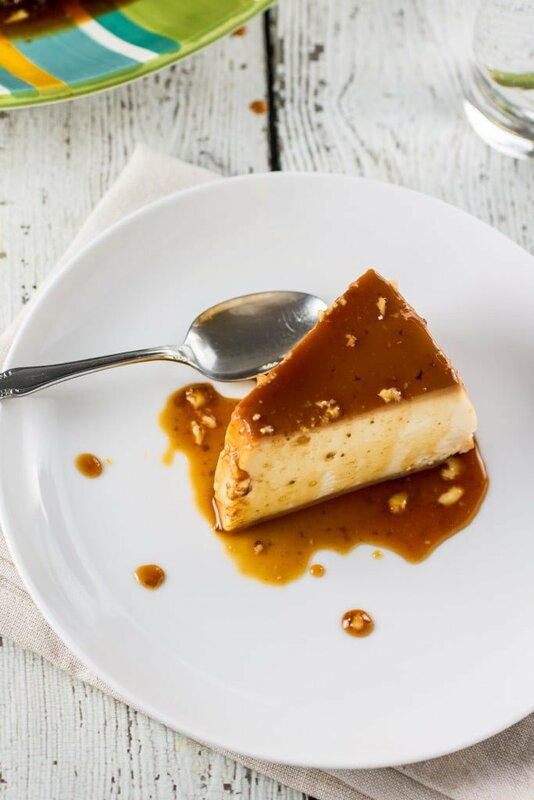 Some people believe that the Brazilian Flan, or “Pudim”, originated from a simple recipe made by a Portuguese abbot, called “Pudim de Priscos”. Consisting of sugar, yolks, water, Port wine and pork lard (I know! Weird! ), his recipe was an absolute success wherever it was served. However, the abbot refused to share his recipe with anyone. And, to prove that nobody could make his creation with such perfection, he held a public competition against a professional pastry chef. Of course, the abbot won the duel and proved that he was the only one that could make that delicious flan. Unfortunately, his recipe collection disappeared mysteriously after his death. I guess we have to thank the abbot for having that silly duel so we could have a glimpse of his recipe, cause otherwise flan wouldn’t exist. – I made 2x the recipe for the pictures in this post. I just wanted it to be tall and beautiful for the pics. You can double the recipe below if you want your Brazilian Flan to look exactly like that. – You can also make the flan in small individual angel food pans or in ramekins (but then it won’t have the characteristic hole in the middle). – Make sure your angel food pan has a solid bottom and not a removable one, or you flan mixture will leak. – Baking it in bain marie is absolutely necessary so it can bake slowly until the ideal texture. – The longer you let it blend, the better. I do it for about 5 minutes. That way the flan will be super smooth! – You can make more caramel to serve on the side, if you want! – My coworkers described the flavor as similar to creme brûlée. If you like creme brûlée, you will definitely like this recipe! In a sauce pan, melt the sugar over medium high heat. After about 10 minutes, once it's golden brown, add the water and let it cook, stirring lightly, until it thickens a bit. Pour the caramel into a 10 inch Angel Food Pan and swirl it to cover the bottom and sides. Let it sit for a few minutes so it hardens. 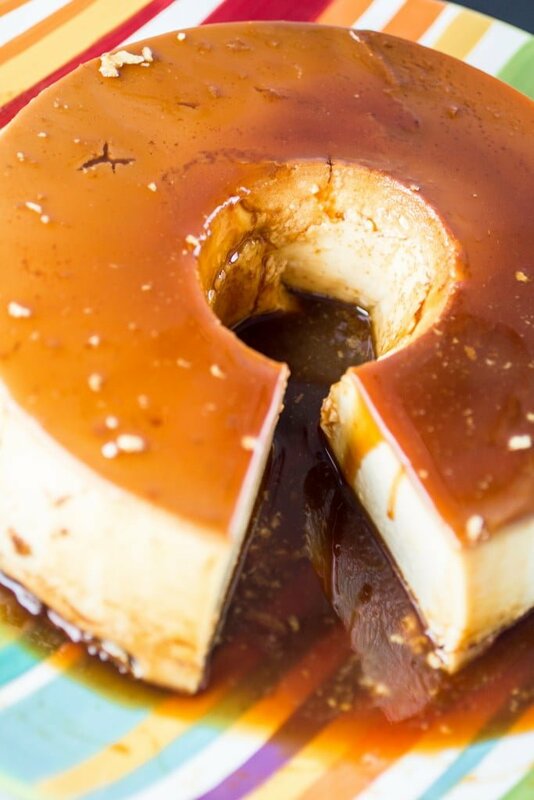 It is important that the caramel firms before you add the flan mixture so they don't mix together. Pour the flan mixture into the angel food pan and cover with foil. Fill a large baking pan (a lasagna dish works great!) halfway through with water and place the angel food pan in it. Bring it to the oven and bake it in bain marie for 1 hour and 30 minutes or until the top is golden brown. I like to wiggle the pan a bit to see if it's still liquidy. Sometimes I have to leave it for an extra 15 minutes. You can also insert a cake tester to check. It should come out clean or almost clean. Let the flan cool and transfer it to the fridge to cool overnight. To remove the flan from the mold, just run a knife along the sides and then carefully flip it on a serving plate. I love eating flans and have been craving some! Never tried making as I am so scared thinking I might fail at it! Thanks for this recipe, I will be making it soon! That’s so funny, I was just thinking about flan the other day. I love it and haven’t had it in forever. I also always enjoy your Brazilian stories! Pinned to try later! This is the most famous and delicious brazilian dessert! 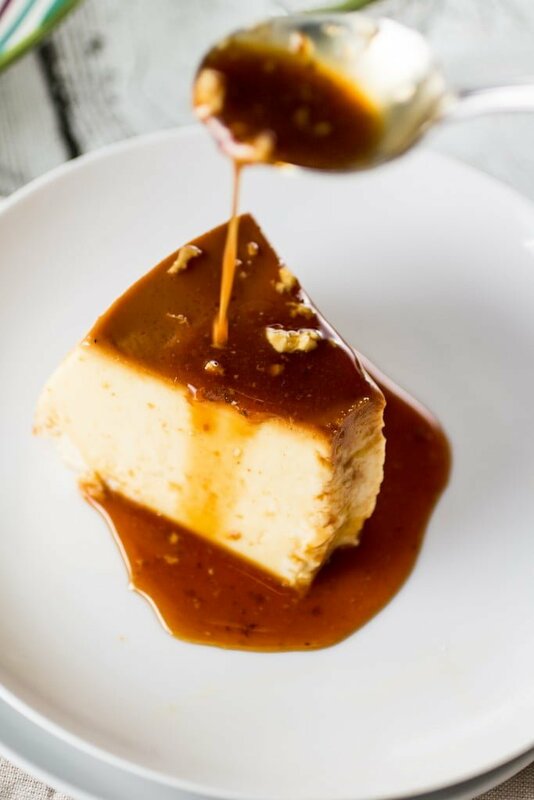 And your flan is simply wonderful!! 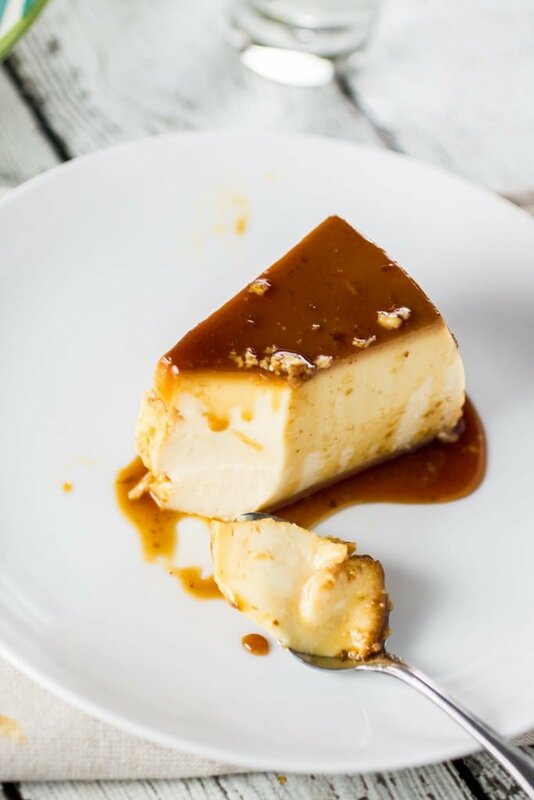 I wish my flan was so smooth as yours! Nothing beats an old classic isn’t it Olivia? This is a favourite melt-in-the-mouth dessert of 10 out of 10 Brazilians! Looks awesome Olivia! Love flan and it does taste like creme brûlée. I make it all the time and use a similar recipe. It is very popular in Europe and Bulgaria, where I was born :) Love the beautiful pictures! Pinned! I just love flan, but I’ve never made it myself. Love how easy this is! Your pictures make this look irresistible! Olivia this flan is amazing. I love creme caramels.. the burnt sugar flavour gets me every time. So I know this flan would have tasted incredible! 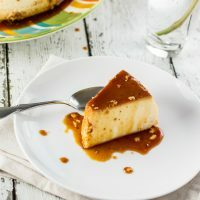 I’ve never had or made flan before, but this looks amazing! It looks wonderful! What size can of sweetened condensed milk does the recipe call for? It sounds like an 8 oz. can? Just want to make sure, since I know it comes in different sizes, and I have a 14 oz. can at home. Thanks for the reply! Looking forward to trying this. Did you use a 2 peace angle food cake pan? Hi Brenna! I’m sorry for the delayed response. I used a 1 peace angel food cake pan. Haven’t tried with a 2 peace but I would be worried the batter would leak, since it’s very liquidy! I’m about to make your flan :) I’m in Australia and the only pan I could get was a fluted ring pan so my fingers are crossed it works! I’m make double the recipe and was wondering whether you also did double the sugar for the caramel too? Hi Mandie, I hope this is not too late. I only doubled the batter recipe, not the caramel. Although, more caramel can never hurt! :P Let me know how it turns out! I am going to try this…looks wonderful. I’m Just checking on the amount of whole milk. It is a total of 16 ounces, correct ? (Recipe said 2 cups but to use the condensed milk can, which is 14 ounces, to measure so that got me wondering.) thanks. Oh thanks for listening but now I’m afraid I led us astray. I just measured how much fluid fits into a 14 ounce condensed milk can and would you believe…it’s 9 fluid ounces. I guess the 14 ounces represents weight rather than volume. I thought that can looked kind of small for 14 (fluid) ounces. Sorry. Anyway-using the can to measure works fine and that was your original instruction! I made it and the flan was great. I could still use a little practice making caramel sauce. I made this for a potluck, it was very well received. The texture was very creamy. I used a large ramekin since I didn’t have a angel food pan. I can see this isn’t the last time I’ll make it. Do you use all the egg or just the yolk? Just a heads up that it says it takes 9.5 hours to make- I believe that is a mistake? Also, for the bain marie, does the water need to be hot when you pour it into the lasagna pan? Or is it okay if it’s cold? I am going to make this for my Brazilian boyfriend’s birthday- I can’t wait to see how it turns out! Hi Chandler! The time is accounting the time it takes to set in the fridge. :) It does not take that long to make it! And no, the water does not need to be cold. I hope you enjoy it! I recently promised a Brazilian friend that I would make a flan for a Saturday brunch. After looking at several online recipes, basically the same, I choose yours. After all, you claim yours is best! So I gave it a shot, whipped it up Friday evening, and popped it in the fridge to cool overnight. Saturday morning my friend texted a change of plans. Family members, here from Brazil, we’re coming to his house so we would be eating there. Ahhhhhhh! I’ve just made a traditional Brazilian dessert for the first time and am about to feed it to Brazilians! No worries!!! It turned out beautifully! Caramel sauce was perfect! They all literally raved over the taste and creaminess. One older gentleman genuinely told me it was the best he had ever had, and he’d eaten it his whole life. Frankly the response was overwhelming. But I beamed! You know how it is! The “feeding” brings more joy than the cooking. Thank you for helping me make a memorable moment!!! will this work in a muffin pan? I need to make about a hundred individual servings. Thank you. WILL THIS WORK IN A MUFFIN PAN? I NEED TO MAKE ABOUT 100 INDIVIDUAL SERVINGS. THANK YOU. Harris Taylor, I’ve been making this same recipe for years, and it works in any type pan. Muffins are small, so check time often. It should be basically set,with a little jiggle in the center. Over baking can make it rubbery, but it will still taste good. Olivia, this turned out AMAZING! It was smooth and creamy and absolutely fantastic. I baked it in a loaf pan as that was what I had. It took me 2.5 hours until the top was golden brown but didn’t have any cracks when unmolded and was smooth and delicious and not eggy like other recipes I have tried. The version of this pudding I was attempting to replicate is a bit lighter/airier with more bubbles and a little less dense, I will try replacing some of the condensed milk with more milk or orange juice to see if I get the results I am after, or maybe beat the eggs first before adding the other ingredients? Don’t get me wrong, everyone that tried this loved the texture and thought it was PERFECT, I am just seeing if I could get it a bit lighter in texture, any suggestions would be welcome. Thanks for a delicious easy recipe, I will be making this as many times as I can get away with. I make mine with 8-9 eggs. I like the consistency and flavor way better. It does add about 15 minutes to the cooking time but well worth it! Hi Cathryn, the batter is too liquidy for a two piece pan. I think it would leak! Hi Ann, sometimes the caramel hardens when you add the water, due to the temperature shock. Just keep cooking, under low heat, until it melts again. Hi Sonia, yes, that should work fine! Hi Olivia, I came across your recipe in search of a traditional style flan to make for my husband’s birthday. I was quite hesitant, as this was my first attempt and did not have a bundt pan, so I had to use a single 8” round cake pan. I followed your recipe exactly. After 1.5 hours, the flan was mostly liquid still, I am assuming because of the pan I used, nonetheless I kept baking, it was over 3 hours before it was a nice golden brown. I popped it into the fridge and hoped for the best. The next morning I flipped it onto a plate and was amazed by the most beautiful dessert I have ever made. This flan was picture picture, so perfect, I immediately instagrammed it and received comments like “Magazine Worthy!” Not only that, my husband, a lifetime flan fan, stated it was the most delicious flan he has ever had, hands down. I have to say I wholeheartedly agree! So thank you Olivia! I look forward to making this flan again and again. Do you remove the foil paper on the angel food pan before putting the flan in the oven? Or do you bake the flan in the oven covered with the foil?